It’s a good bet that if Welch were to boil this down to just one measurement, he’d emphatically opt for employee engagement, because that’s where it all begins. In the “Engagement Economy,” employee engagement is the tip of the spear. Done right, engagement is a continuum of goodwill, value and reciprocity. Think about it: employees -> customers -> prospects -> partners -> shareholders. If your employees are not engaged, you’re stuck in the starting gate. The fact is, whether employees or customers, people want to be understood and valued, they need to connect, and they like being part of something bigger than themselves. These are fundamental human desires, baked into our DNA. We don’t function at full capacity unless we’re engaged—at least, not for long—and that holds true at work as well as at play. When not engaged, we tend to mentally check out, just go through the motions or drift to the sidelines, the competition or a new job. How does one measure employee engagement? Start with something that looks similar to Maslow’s Hierarchy of Needs. But instead of showing fundamental human needs, take a look at different levels of employee engagement. 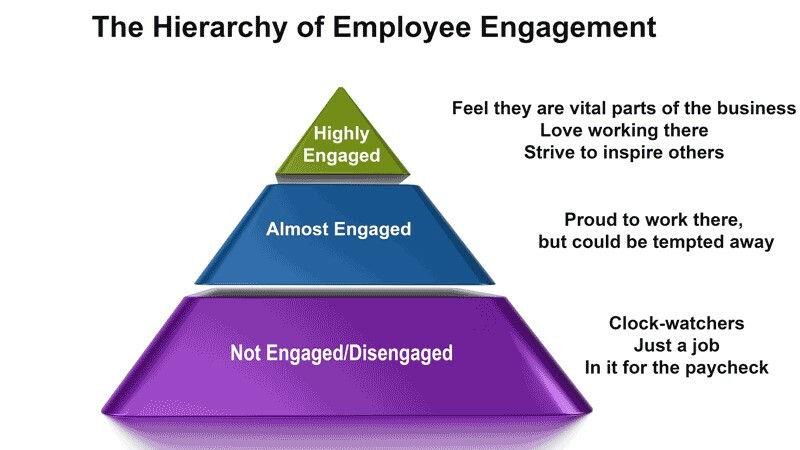 At the bottom of our employee-engagement pyramid are the clock-watching not engaged and disengaged who are there just for the money. In the middle are the almost engaged who are proud to work at the company but could be tempted to go elsewhere. And topping the hierarchy are the engaged and highly engaged who feel they are vital parts of the business, love working there and strive to inspire others. It’s not hard to see in which categories you want the bulk of your employees to be. Seventy percent of US employees are not engaged at work, meaning they are not involved in, enthusiastic about and committed to their work, according to a 2017 Gallup report. Evidently, this figure has not changed much in recent years. Meanwhile, The State of Engagement, a new study that Marketo conducted with a third-party research firm, shows that, while 71 percent of global companies have an engagement strategy specifically for employees, only 26 percent of employees say employers are exceeding their expectations for engagement. From my perspective, employee engagement is not a nicety. It’s an imperative. As marketers, we have to be able to practice what we preach, which means creating a culture of engagement inside our own organizations. Based on my experience, here are the four must-take steps for any organization looking to create such a culture. 1. Make it a mandate from the top—Have a clear call to action, coming from the highest levels of the org, ideally from the CEO. Send the message to all management that if you are not driving employee engagement, you’re missing the boat, and the company is in danger of being ineffectual in the marketplace. 2. 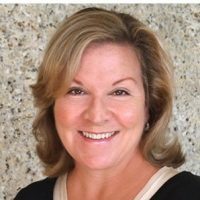 Make sure it’s marketing-led, in partnership with HR—Marketing owns engagement with customers, prospects and partners, and thus should also own employee engagement. Hire a person dedicated solely to overseeing employee engagement, reporting to a senior marketing executive, likely on the brand or communications team, so that your engagement strategy for your people is tightly coupled with your brand promise and values. 3. Do some serious introspection—Start with examining how your company interacts with employees versus what your employees really want and need. What I discovered when I went through this exercise was that our engagement efforts were only going one way: We were not focusing on the employee journey, and we lacked a vehicle for ongoing listening and feedback. You must send information consistently across the company and cannot take an ineffective transactional approach to encouraging employee behavior and actions. If you do this, you will fail. 4. Create a platform for the employee journey—Look at every touch point of the employee experience, from recruiting and onboarding to enabling, listening, developing and retaining. Then you must design programs to drive intellectual buy-in (communicating vision, plans and “how you fit in”), emotional buy-in (gamification, social amplification, peer recognition and so on) and brand advocacy. At Marketo, we use our own engagement platform and have deployed a technology that’s easy for our employees to sign onto and use every day, from any device. It helps them to stay plugged into what is going on in the company, with each other and with the industry. When my organization followed the steps above, did they lead to success? Absolutely. We can now measure engagement through employee activities, and since the launch of our engagement platform earlier this year, have seen our number of highly engaged employees climb to 37 percent. I think Jack Welch would be impressed. What’s even more impressive is that this kind of employee engagement is achievable within almost any organization that puts its mind to it and makes the investment. As for those that don’t, don’t say I didn’t warn you. This post originally appeared on Marketing Land on September 7, 2017.